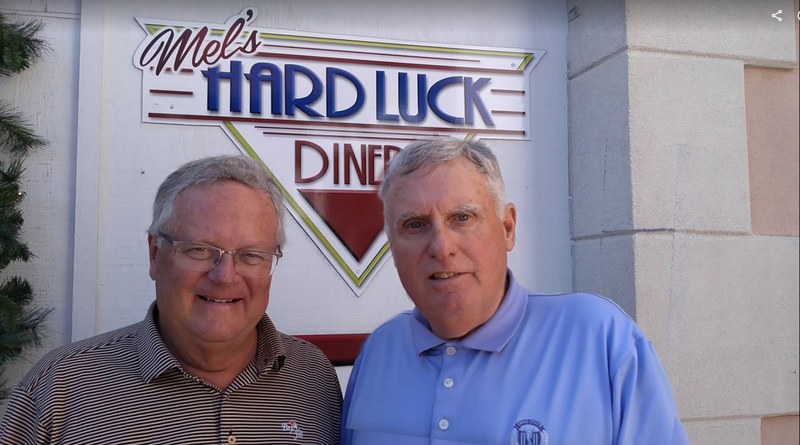 Fred Altvater (right) is now the seventh golf website partner for Len Ziehm on Golf. We are delighted to announce another partnership agreement for the Len Ziehm on Golf website. Ohio-based Fred Altvater, a long-time friend and a golf teacher as well, is joining us on two levels. Fred’s Back 9 Media Group includes the Ohio Golf Journal, a fine digital publication that provides golf tips and articles on all phases of golf. What makes Back 9 Media unique among our partners is that it also includes a video companion, Back 9 Report TV. Back 9 Report TV can be found on Roku but is also posted at http://back9report.com/. Back 9 Report can also be heard on Blogtalk, TuneIN and ITunes. 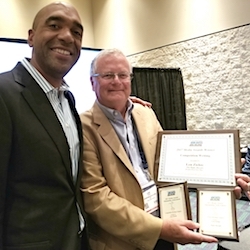 Fred, who started his golf media ventures in 2007 and is the publisher of Ohio Golf Journal, won two Outstanding Achiever awards for his 2018 video projects at the International Network of Golf’s Media Awards. They were presented at the PGA Merchandise Show – an annual January gathering of leaders from all segments of the golf industry in Orlando, Florida. Ohio Golf Journal becomes the seventh golf website partner for LZOG. All are a bit different but share the common goal of providing useful and interesting information to every variety of golfer. 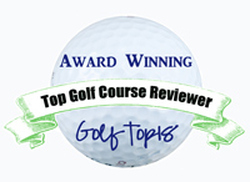 The other partner sites are Rory Spears’ Golfers on Golf radio, Tim Cronin’s Illinois Golfer, Cheryl Justak’s Golf Now!Chicago, Brian Weis’ GolfTrips.com, Dave Lockhart’s LInksVideo and Jason Bruno’s LInksNation. LZOG now has partner sites based in five states — Illinois, Indiana, Wisconsin, Ohio and Florida. In the early 1980s the Chicago amateur ranks were dominated by a fabulous foursome, David Ogrin, Gary Pinns, Gary Hallberg and Jerry Vidovic. Toss in Lance Ten Broeck and Roy Biancalana, who were slightly younger than that group, and you had what I consider the Golden Years of Chicago amateur golf. Ogrin, Hallberg and Ten Broeck were winners on the PGA Tour. Pinns and Biancalana played on that circuit and Vidovic won a national title – the U.S. Amateur Public Links. It’ll be tough to top that group. The last few years, however, produced a Fabulous Foursome, too, in Doug Ghim, Nick Hardy, Patrick Flavin and Tee-K Kelly. You could also mix in the slightly older Vince India and Brad Hopfinger, too. Those two are among the select nine players with wins in both the Illinois State Amateur and Illinois Open and are now past the rookie stage on the Web.com Tour. Ghim, Hardy, Flavin and Kelly all had their moments as amateurs and are new to the pro game. It’ll be interesting to see how their careers play out, but – suffice it to say for now – they’ll be missed around the local tournament scene this season. Who was the best as an amateur? That’s hard to say. Ghim ventured to the University of Texas and basically limited his Chicago play to the Western Amateur. Kelly won the Illinois State Amateur twice and was runner-up another time. Hardy had the best single tournament performance with his record 28-under-par over 54 holes to capture the 2016 Illinois State Amateur and he was always a factor in the Western Amateur and Illinois Open. Flavin had the best single season when – in 2017 — he became the first player in 37 years to win both the Illinois State Amateur and Illinois Open in the same year. Ghim moved to Las Vegas and finished a solid third in the final stage of Web.com Tour qualifying. India, the reigning Illinois Open champion, regained his Web.com Tour card with a 12th place finish in his return to Q-School. They’ll be easy to follow, since they have a tour with almost weekly tournaments to play in. Both made the cut in the first one of 2019, in the Bahamas. Kelly already won on the PGA’s Latinoamerica circuit – a whopping seven-shot victory in 2017 — and will be able to compete there again. His challenge will be to elevate his game to another level, and another tour. For good friends Hardy and Flavin, it’s a little different. They established residences in Scottsdale, Ariz., during winter that are 10 minutes apart. In April, or whenever the Chicago weather permits it, they’ll return to the area and practice at the Merit Club in Libertyville. Finding tournaments might be a challenge, as neither has status on any tour yet. Flavin survived only the pre-qualifying stage of Web.com Tour qualifying. He had better luck after moving to Scottsdale in November, finishing seventh and second in two mini-tour events with a missed cut in an event in Mexico in between. “My game feels good, and I love being out here,’’ said Flavin, who is living with a college teammate from Miami of Ohio until his return to Chicago. Flavin didn’t get the big tournament exposure that Hardy did as a member of the University of Illinois’ powerhouse teams, so he’s taking a different approach to his first season as a pro. The Latinoamerica Q-School will be a special experience. The competition will be held in Brazil, on the same course that hosted the last Olympics golf tournament. Hardy, who made the cut in two U.S. Opens as an amateur and earned paychecks on both the PGA and Web.com circuits last year after getting into events on sponsor’s exemptions, did enter the Monday qualifier for the Waste Management Phoenix Open on the PGA Tour. Other than that he wasn’t sure where he’d be playing immediately after returning to the U.S. following a winter visit to Australia. Hardy made it through the first stage of Web.com Tour qualifying but came up two strokes short in the second stage. Players who reach the third and final stage have at least limited status on the circuit. On the women’s front Chicago will have a changing of the guard on the Ladies PGA Tour. For nearly three decades the only Chicago player on the premier women’s circuit was Nicole Jeray. With Jeray, 48, taking a teaching job at Mistwood in Romeoville, the lone Chicago representative on the LPGA circuit will be Winnetka’s Elizabeth Szokol, and she has the credentials to do quite well. Szokol, who will be an LPGA rookie in 2019, earned her place on the circuit by finishing fourth on the Symetra Tour money list in 2018. Her second season on the LPGA’s developmental tour was a solid one after she was sidelined for eight weeks by knee surgery in January. She won the IOA Invitational in May – her second start of the season – and tied for third in the season-ending Symetra Tour Championship. In between Szokol had four more top-10 finishes en route to earning $76,612 in her 20 tournament appearances. She’s expected to make her LPGA debut overseas in February. The LPGA has four tournaments – in Australia, Thailand and Singapore – before holding its first event in the U.S. at Phoenix in March. Jeray, meanwhile, isn’t done competing. She earned a place in one of the LPGA majors — the KPMG Women’s PGA Championship — with a strong showing in last year’s LPGA Teaching & Club Professionals National Championship and is especially focused on winning the Illinois Women’s Open for the third time on the course where she now works. Already the IWO champion in 1998 and 2003, she hopes to become the first player to win the tournament in three decades. The Chicago area has hardly been rich in players on the pro golf tours in recent years, but that situation improved significantly last weekend. 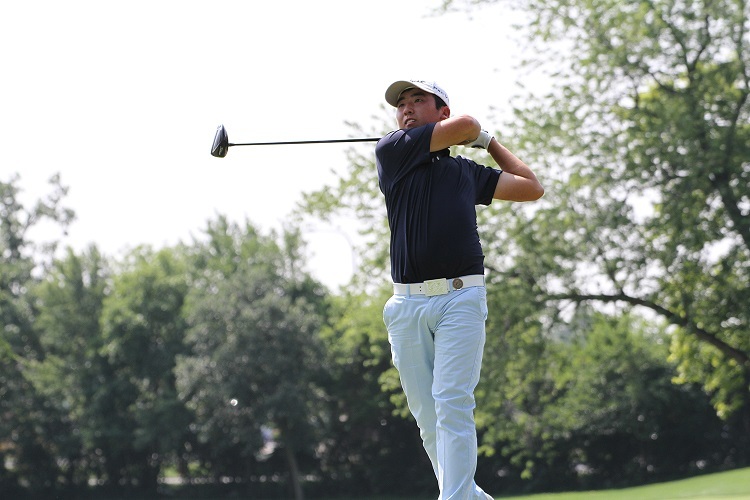 Arlington Heights’ Doug Ghim and Deerfield’s Vince India earned spots for 2019 on the Web.com Tour, the PGA Tour’s alternate circuit, and former world No. 1 Luke Donald, shaking off lingering back issues, played in his first American tournament in eight months. Ghim, the low amateur at last year’s Masters, tied for third in the 72-hole finals of the Web.com Tour’s qualifying tournament in Chandler, Ariz., and India, the reigning Illinois Open champion, finished 12th. They were paired together in the final two rounds. That means both have a significant tour to play on in 2019. The Web.com offers direct advancement to the PGA Tour for its best players. Ghim, who has relocated to Las Vegas since finishing his collegiate career at the University of Texas, is guaranteed 12 tournament starts in 2019 and India will be assured of at least eight. Ghim, shooting 66-65 on the weekend, finished 25 under par for the 72 holes and India, who opened the tournament with a 63, finished at 23 under. 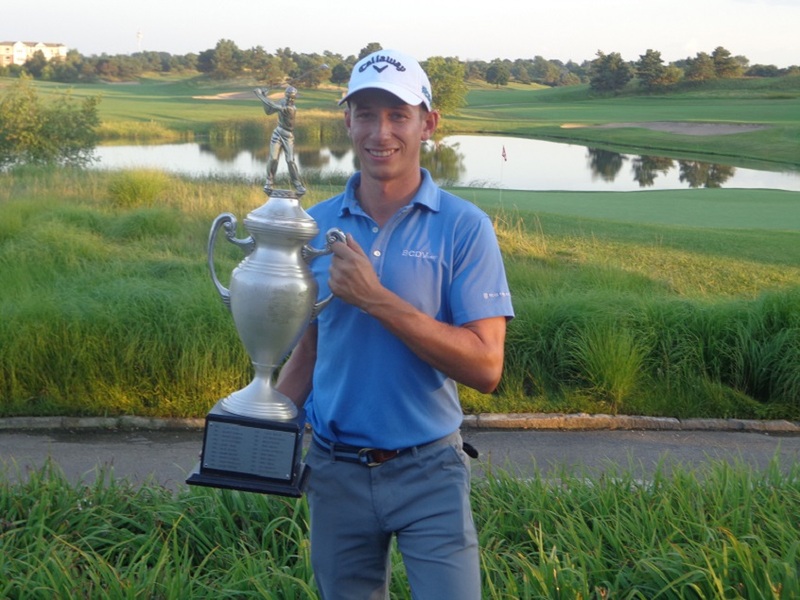 Vince India became just the ninth player win withs in both the Illinois State Amateur and Illinois Open when he won the Open title at The Glen Club this year. He won’t likely be able to defend that title, but the Web.com Tour will have a new event there in June. “That’ll be my Illinois Open,” said India. India, one of just nine players to own wins in both the Illinois State Amateur and Illinois Open, was a Web.com regular in 2017 but couldn’t retain his privileges for this year. Like Donald, India has battled back issues since concluding a stellar collegiate career at Iowa. Also like Donald, he used stem-cell therapy in his recovery effort. Web.com qualifying is held in three stages. Two Chicago amateur stars of the past, Northbrook’s Nick Hardy and Highwood’s Patrick Flavin, didn’t make it to the finals stage and will have to survive Monday qualifying rounds or land sponsor exemptions to get into the circuit’s tournaments. Dylan Meyer, Hardy’s University of Illinois teammate, tied for 50th in the Web.com finals after a promising start as a pro. Using sponsor exemptions after his collegiate season ended in June, Meyer earned $275,109 in PGA Tour starts and another $10,060 on the Web.com circuit. While he’s not guaranteed any Web.com starts, Meyer will likely get into a few tournaments because he qualified for the finals of Q-School. LUKE IS BACK: Luke Donald spent parts of 2011 and 2012 as the world’s top-ranked golfer after graduating from Northwestern and he remained active golf-wise in the Chicago area through his membership at Conway Farms in Lake Forest and support work for the NU golf program, Western Golf Assn., and First Tee of Greater Chicago. Donald’s playing career tapered off after he suffered a herniated disc in his back that led to his dropping off the circuit in April. After taking three months of complete rest while receiving stem-cell therapy Donald returned to competition in October at the Alfred Dunhill Links Championship on the European Tour. So far the results haven’t been there. Donald missed the 54-hole cut in the Dunhill Links and his team was 10th among the 12 twosomes competing in last week’s GTE Shootout in Naples, FL. He’ll join Wheaton’s Kevin Streelman to give the Chicago area a presence on the PGA Tour when the circuit resumes its schedule in January. CHANGING OF THE GUARD IN LPGA: For over two decades Berwyn’s Nicole Jeray was basically the only Chicago area player on the Ladies PGA Tour. Now Jeray is turning her focus to teaching at Mistwood Golf Club in Romeoville and Winnetka’s Elizabeth Szokol will carry the Chicago banner on the LPGA circuit. Szokol spent two collegiate seasons at Northwestern and two at Virginia before earning a place on the LPGA’s satellite Symetra Tour last year. Szokol advanced to the LPGA circuit by finishing fourth on the Symetra money list this year. She earned $76,612 and picked up her first victory at the IOA Invitational in May. WINTER SCENE: Steve Kashul’s “The Golf Scene’’ will begin its Winter Edition on Sunday. The show, which will run at various times, is celebrating its 25th year anniversary on NBC Sports Chicago. The Chicago Golf Show is also gearing up for its 36th winter staging. It’ll be held Feb. 22-24 at the Stephens Convention Center in Rosement. The Illinois PGA changes its president every two years, and the most recent changing of the guard on Nov. 19 was much different than all the previous ones. When Jim Miller took over the reins from Mark Labiak the section gained an unusual new leader. Rarely has the IPGA had a president from a club outside of the Chicago area. Miller is in his 14th season as head professional at Bloomington Country Club, which is located in central Illinois. And that’s not all. Miller is also continuing a family tradition. His father Hal was the IPGA president from 1982-83, when he was in the midst of a long and successful run at Evanston Golf Club in Skokie. The Miller & Miller scenario begins at Evanston, where Hal entered the golf business as a caddie. He later worked there on the practice range and as a starter before becoming an assistant professional under the legendary player and teacher John Revolta in 1960. Hal spent seven seasons as a Revolta assistant, then became the head professional in 1966 following Revolta’s retirement. Hal was the head man there for 35 years before retiring on Dec. 31, 2001. Now 82, he’s an honorary member of the club that he served in one capacity or another for about 50 years. Selected into the Illinois Golf Hall of Fame in 2007, he also remains involved with the IPGA as a regular rules official at its tournaments. A Glenview resident, Hal and wife Kathleen were the parents of five children, all of whom worked at Evanston in one capacity or another while growing up. Jim is the only one who followed Hal into the golf industry. Jim, 52, graduated from the University of New Mexico in 1990, then spent three years as an assistant at Sunset Ridge, in Northfield, and another at Indian Hill, in Winnetka, before Hal had an opening on his staff at Evanston. Jim eventually succeeded Hal as the club’s head professional and held that job for five years. His move to Bloomington came in 2005 and was made largely for family reasons. Jim did. When as opening developed at Bloomington he applied, was hired and has found a good job fit. Their four children are Parker, now 21; Katie, now 19; Ashley, now 17; and Bailey, now 14. Bloomington, which has 330 golf members, was agreeable to Jim’s need for more family time. A good enough player to qualify for two PGA Club Professional Championships and become the runner-up in the 1995 IPGA Match Play Championship, Miller is focused on a broader range of duties now. Bloomington has always been a prominent tournament site. In addition to welcoming the Illinois Open in 1980, the club has hosted eight Illinois State Amateurs including last year’s version — more than any other club. Bloomington has also hosted the Illinois State Women’s Amateur five times. Miller inadvertently played a role in hurting Bloomington’s chances to bring an Illinois Open back downstate. He was the IPGA’s tournament chairman when the decision was made to alter the format of the event in hopes of expanding the field and increasing the entries. The Glen Club, in Glenview, became the permanent site for the finals and a nearby club was needed as the alternate site each year. Bloomington was too far away to fit the bill, but Miller is happy with the format change made in the section’s premier event. An IPGA director for three years while at Evanston, Miller dropped off the board when he made the move to Bloomington but he returned in 2009 and was elected an officer in 2015, when he ran for the secretary’s position. That started his progression to the presidency. He was secretary in 2015-16 and vice president in 2017-18. Now he takes on the responsibility of leading an organization with about 800 members. The IPGA presidency is much different than when his father was in charge. The IPGA had an executive director (Ken Boyce) at that time but no long-term headquarters and only two assistants for Boyce. Now executive director Carrie Williams heads a staff that has at least three times that number when summer interns are factored in and a long-term base at The Glen Club. Jim sees one big issue ahead. That’s not his only chore, of course. Let’s make this perfectly clear from the outset. This is not a farewell/retirement column. It’s a reflection on my first 50 years covering golf in the Chicago area and beyond. It’s been a great run that I envision continuing for many years to come. I consider the start coming at the 1968 Western Open during my first post-college job for the Hammond (Ind.) Times – now The Times of Northwest Indiana. The Western was played at Olympia Fields that year with Jack Nicklaus winning the title. Covering PGA Tour events was much different then than it is now. Nicklaus, Arnold Palmer and the top players would sit around a table in a small room designated for the press, drink a beer, smoke a cigarette and basically chew the fat with no more than a half-dozen writers. Things changed quickly after that. The following year I started my 41-year career at the Chicago Sun-Times. 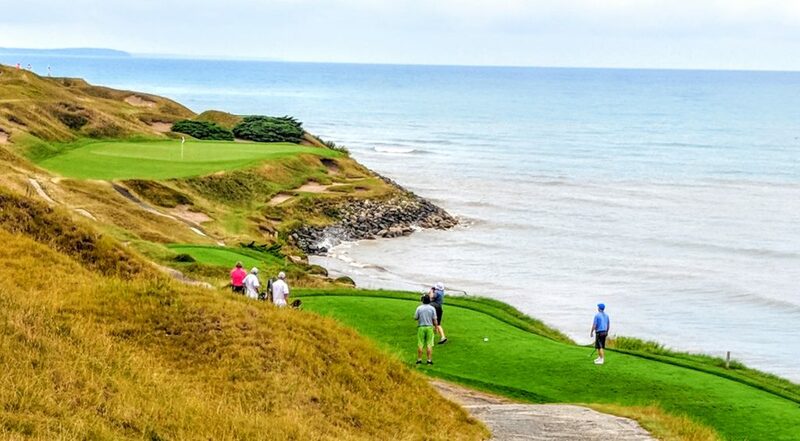 I covered many other sports there – most notably the Northwestern teams for 11 years, pro soccer for 26 years and Wolves and Blackhawks hockey for the final 16 – but golf was always a fixture on my schedule. The methods for creating and transmitting my reports changed dramatically over the years. First it was dictation via phone from the tournament site to the office. Then we carried both typewriters and telecopiers to the events and faxed the stories in. Eventually fax machines gave way to Radio Shack computers, which were very slow-moving. Note-taking by hand was the initial method for interviewing. Now there’s digital recorders and transcripts of interviews are even provided at the bigger tournaments. Stories are sent via email and writers can even double as photographers, taking pictures with cellphones and then transmitting them via laptops. My first big golf event at the Sun-Times was the 1972 Western Open at Sunset Ridge. It was interesting to return to that club this fall for the Western Amateur. There were no other stops at that club in between, so revisiting was special. Much to my delight, the Daily Herald asked me to be its golf columnist immediately after I retired from the Sun-Times in June of 2010. I completed my ninth season with the Daily Herald this year and have also written for more years than that for both the Chicago District Golfer and Chicagoland Golf. 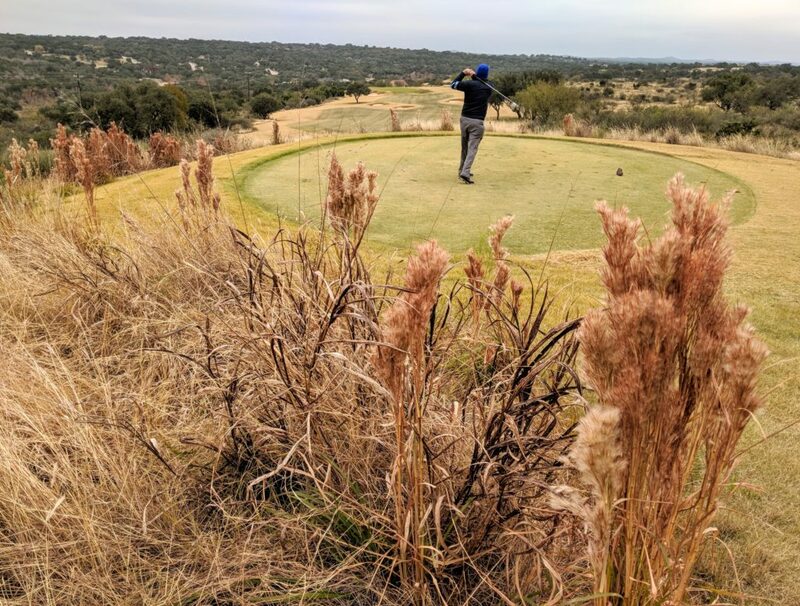 Mix in some spot assignments for other publications, websites and tournament programs, and that’s a little of words and time spent devoted to birdies and bogeys, titles won and lost, course openings and closings and – even occasionally – some controversies. Based on the research available, I can claim to be the longstanding Chicago golf scribe. Charles Bartlett, the legendary Chicago Tribune golf writer, was on the beat from 1936 to 1967. That’s 31 years. I was arriving on the scene as Bartlett was retiring, and I never met him but I’ll bet we could have shared some great stories. The best performance by a local player in my era has been – by far – Nick Hardy’s 28 under par 260 in the 2016 Illinois State Amateur at St. Charles. The most exciting finish came in a 1991 LPGA event presented by my then-employer. Martha Nause rallied in the final four holes of an event called the Chicago Sun-Times Shootout at Oak Brook Golf Club, finishing birdie-birdie-birdie-eagle to win by one stroke. The eagle came off a hole-out from 100 yards on her final shot. While the local scene was always close to my heart I have witnessed first-hand 28 U.S. Opens, 11 Masters, 19 PGA Championships, four U.S. Women’s Opens and the last 34 Western Opens. My debuts at both the U.S. Open and Masters were unforgettable. Johnny Miller’s record 63 on a rainy final day at Oakmont gave him the 1973 U.S. Open. The last of Nicklaus’ six wins in the Masters came in 1986, my first visit to Augusta National, and his charge on the back nine on Sunday was electrifying. I’ve never experienced anything like it, before or since. Seeing all those great moments up close and personal unfortunately didn’t help my own game. 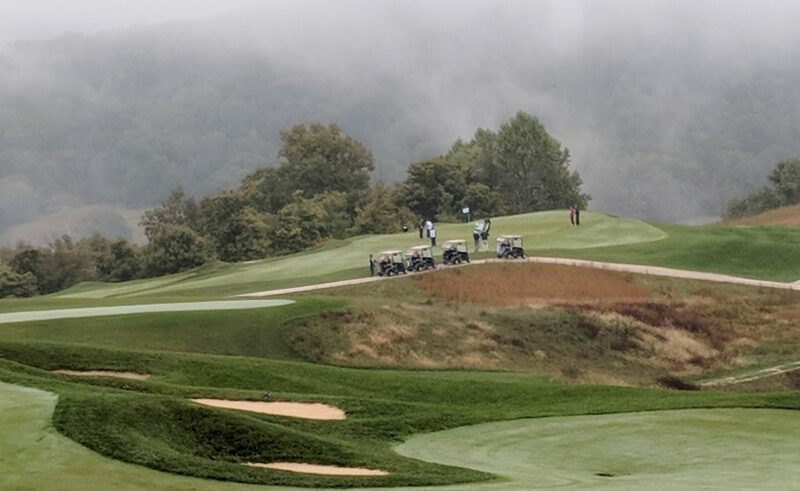 My handicap has never been below 16 but my career low 18-hole round (81) came in this, my 74th year, and – thanks to a strong helping wind and steep downhill terrain leading into the green – I also drove a par-4 hole for the first time in at least 20 years. Maybe I’m just getting better with age – at least I hope so. Golf has changed a lot in my last 50 years. The top stars are playing for much more money and aren’t as accessible or outgoing as they once were. The number of courses has dropped slightly. More women are playing, and youth programs are taking off big-time. In short, the story of golf is an ongoing one, and I’m blessed to be able to report on it. 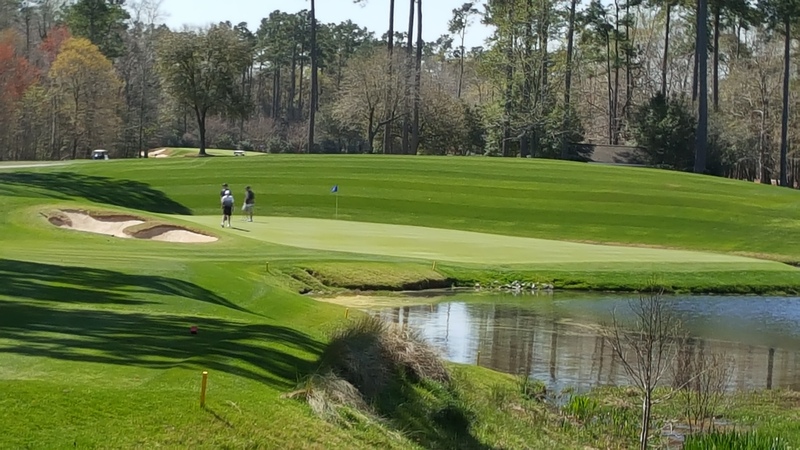 TPC Myrtle Beach will be just one of the top courses awaiting players in the Short Par 4 Fall Classic. The Myrtle Beach Fall Classic had been a four-year success in the South Carolina golf mecca, but the fifth staging – which starts on Sunday and runs through Thursday, Nov. 15 – has turned into an event that’s both bigger and better. Landing Short Par 4 — a golf-inspired subscription service that ships hand curated, top quality branded golf apparel, footwear and accessories directly to golfers – as a title sponsor was a big reason. Short Par 4 is in the first of a three-year agreement for the event, now known as the Short Par 4 Fall Classic. The immediate result was a record entry of 432 players from 38 states for the 72-hole two-person team event. Organizers hadn’t initially planned on that many players and increased the field size by 70 players while the entries were piling in. The course lineup was a plus as well. 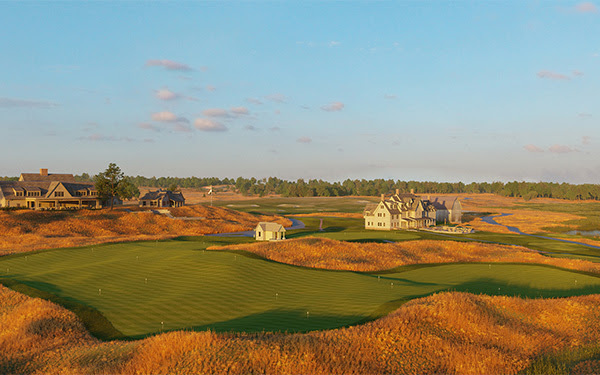 Five of the 16 courses to be used in the event have been ranked among America’s Top 100. 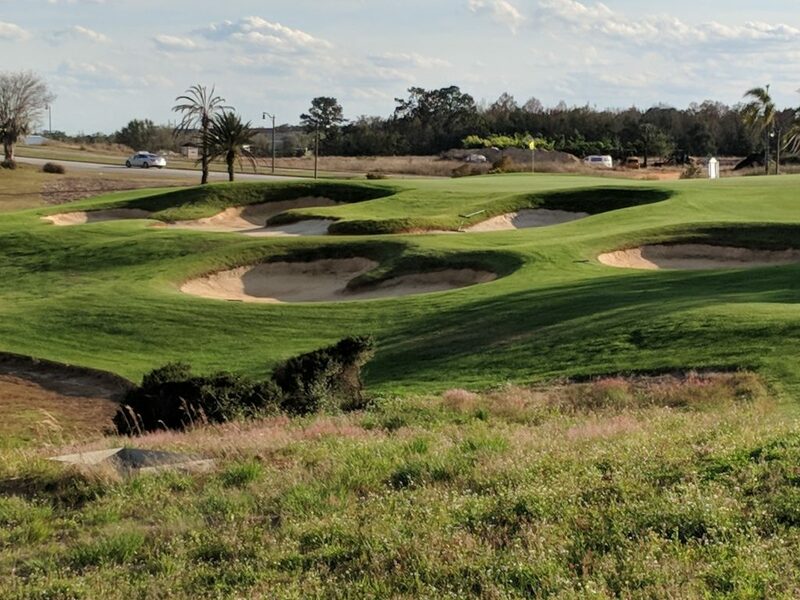 They include such long-time favorites as the Dye and Fazio layouts at Barefoot Resort, Glen Dornoch, TPC Myrtle Beach, True Blue, Heritage Club and Thistle. It’s hard to imagine a course with better waterfront views than Florida’s Sailfish Point. WELL WORTH A LOOK: As most of you know I’m not one who gets carried away by course rankings provided by the golf industry publications. However, Sailfish Point (ranked fourth among residential courses in South Florida and 53rd nation-wide by Golfweek) seems to me underrated. A Jack Nicklaus Signature Course, Sailfish Point opened in 1981 and the Golden Bear supervised a renovation in 2007 so the design is obviously of high quality. More to the point, Sailfish has views that are hard to match on virtually every hole. That’s understandable given its location. The private club is surrounded by the Atlantic Ocean and the St. Lucie Inlet. It’s hard to imagine any Florida course having the water views that Sailfish Point has. It’s also important to note that the water is primarily for the enjoyment of viewers, not to swallow up errantly-hit golf balls. Sailfish Point, officially in Stuart, is part of a 532-acre gated oceanfront community on Hutchinson Island. It has plenty of other amenities, most notably a full service marina, but its golf course is something special. 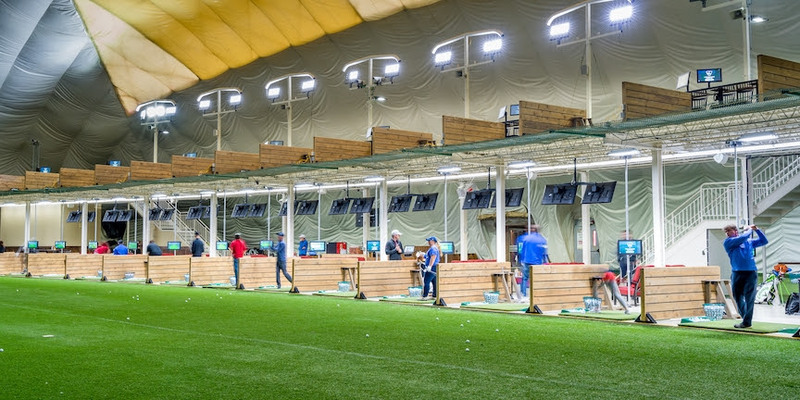 The newly-named Mistwood Golf Dome now offers state-of-the-art Toptracer Technology. 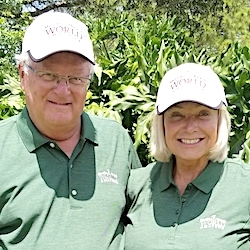 MISTWOOD EXPANDS AGAIN: Though the Mistwood Golf Club course just closed for the season in the Chicago suburb of Romeoville, owner Jim McWethy continued to expand his golf interests. McWethy announced major changes in what had been known as McQ’s Golf Dome in nearby Bolingbrook. 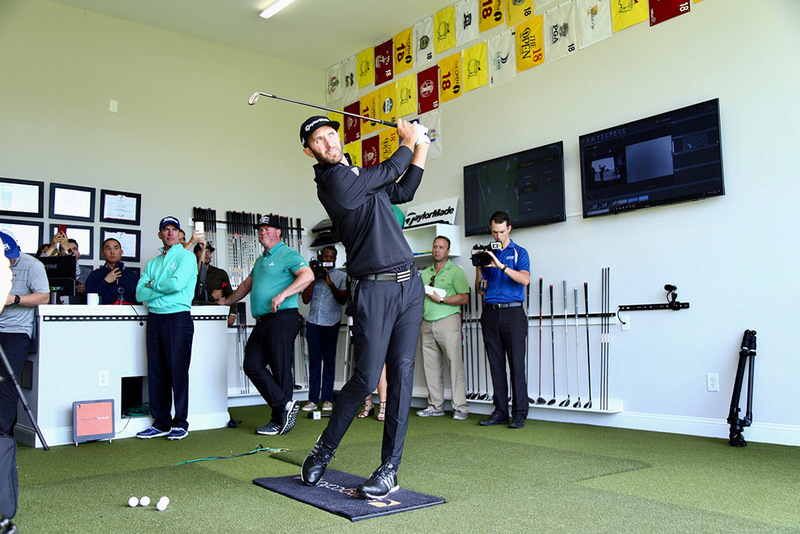 McWethy renamed the facility the Mistwood Golf Dome, the dining area is now McWethy’s Sports Bar and – most notably – the facility is now equipped with TopGolf’s Toptracer Range Technology. Toptracer is a state-of-the-art technology that tracks the flight of a golf ball, displays its path in video and analyzes every shot hit. Mistwood is the first U.S. indoor facility to install it. Users can enjoy virtual golf on the world’s best courses, interactive games and its stat-tracing options. TopGolf, meanwhile, is planning to open a new facility in Schaumburg. 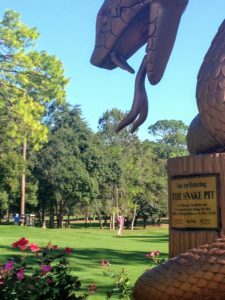 BITS AND PIECES: The Innisbrook Resort, in Palm Harbour, FL., will re-open its South course on Nov. 30 with new greens matching those previously installed at Innisbrook’s Copperhead and North courses. Copperhead hosts the PGA Tour’s annual Valspar Championship in March. Chambers Bay, the public venue in Washington state which hosted the 2015 U.S. Open, closed last month for renovation work on its greens. The course is scheduled to re-open in March with Poa annua putting surfaces. It has already been awarded the U.S. Amateur Four-Ball Championship in 2021. Miami, Fla., is on the brink of losing its only municipal course. Voters have supported the creation of Miami Freedom Park on the site of the present International Links Melreese Country Club. Miami Freedom Park, a commercial development backed by soccer great David Beckham, includes a 25,000-seat soccer stadium that’s to be home to a Major Soccer League team and a hotel. Cog Hill, the 72-hole complex in Lemont, IL., will field a team for the third straight year in the PGA Junior League’s national championships. The finals, expanded from eight to 12 teams, will be played Nov. 16-17 at Grayhawk Golf Club in Scottsdale, Ariz. The Junior League had a record 51,000 boys and girls participating on nearly 4,000 teams this year. Chicago Golf Club member Tony Anderson has been named to the U.S. Golf Association’s Executive Committee and Medinah teaching professional Terry Russell is now the District 6 director for the PGA of America. He’ll represent the Illinois Wisconsin and Indiana sections of the PGA at the national board level. Mike Scully, who had been Medinah’s director of golf during the 2012 Ryder Cup matches played there, has taken a general manager’s post at Reynolds Lake Oconee in Greensboro, Ga. Scully left Medinah to become director of golf operations at Desert Mountain in Arizona before taking the Reynolds Lake Oconee position. 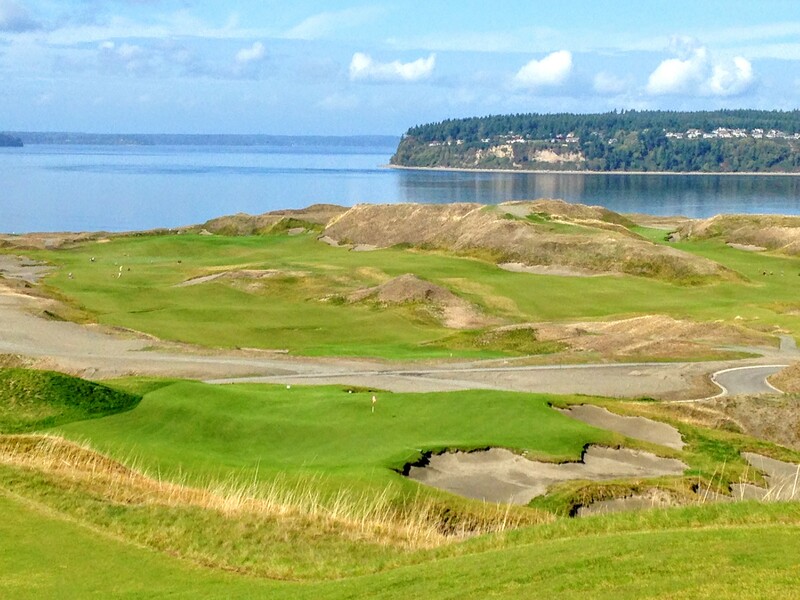 Chambers Bay’s course is closed now, but it’ll re-open in March with all new greens. Six decades ago the Tam O’Shanter Country Club in suburban Chicago was among the most famous golf courses in the world. It was owned by George S. May back then, and May was a man far ahead of his time when it came to golf promotion. Tam O’Shanter opened in 1925. May took ownership in 1937 and hosted his first tournament, the Chicago Open, in 1940. He liked the results, and the next year he created his own tournament – the All-American Open – which offered, for that era, unprecedented prize money for the best men and women golfers. The legendary Byron Nelson was the men’s champion four times in a five-year stretch and notched win No. 10 in his unprecedented 11 victories in a row there in 1945. The All-American Open grew into the World Championship in 1946. It lasted until 1957, with the likes of Gene Littler, Lloyd Mangrum, Jack Nicklaus, Arnold Palmer, Patty Berg and Babe Zaharias teeing it up for – by far — the biggest purses in golf. None of those players had the longlasting impact on golf that Lew Worsham did, however. In 1953, in the first nationally-televised golf tournament, Worsham holed a 104-yard wedge shot on the final hole of the World Championship for an eagle and a one-stroke victory over a stunned Chandler Harper. The drama provided by Worsham’s shot captivated golf fans and triggered the sport’s rise in popularity as both a participant and spectator sport. May eventually had issues with the PGA Tour over player entrance fees and discontinued his tournament in 1957. He died in 1962 and the Western Open resulted in the return of the PGA Tour to Tam O’Shanter in 1964 and 1965. That was the last hurrah for Tam O’Shanter’s glory days. May’s family sold the club to developers late in 1965 and they turned much of the land into an industrial park, closing the course in the process. Now Tam O’Shanter is a nine-hole municipal course owned by the Niles Park District. Only about one-third of the land from the Tam O’Shanter of the May days is still used for golf and the clubhouse burned down long ago. This story does not have a sad ending, however – not by a long shot. The Niles Park District purchased what was left of the golf course and salvaged a nine-hole course that opened in 1974. It struggled for survival for nearly four decades but now, following a year-long course renovation project, Tam O’Shanter isn’t just surviving. It’s thriving. The course renovation was performed by the Illinois-based Lohmann Quitno architectural firm. Drainage was improved and new tee boxes, bunkering and cart paths were installed. Signage on the course was also upgraded as the course was given a more classic look. Only two holes – No. 1, a par-4, and No. 6, a par-3 that had been No. 16 on the old course – are left from the original 18-holer. The renovated nine-holer plays just 2,457 yards from the tips. No. 1 is now the longest hole, at 404 yards, and the rotation calls for six par-4s and three par-3s. It’s nothing fancy, like the Tam O’Shanter of old, but players have been turning out in steady numbers since the renovated course re-opened in June. That was just fine with manager Peter Dubs, who attended golf camps at the course when he was 14 years old and held part-time jobs there before becoming a full-time employee 11 years ago following his college graduation. Chris Urgo, the director of instruction, also progressed from part-time to full-time staffer during a similar time frame. What had once been a failed, very small driving range was converted into the outdoor portion of the Golf Learning Center. The facility is heavy into youth work and draws about 1,000 pupils annually. Immediately after the Niles Park District opened the course the pro shop was operated out of a trailer. Then an Italian restaurant was added, but it didn’t work out very well. 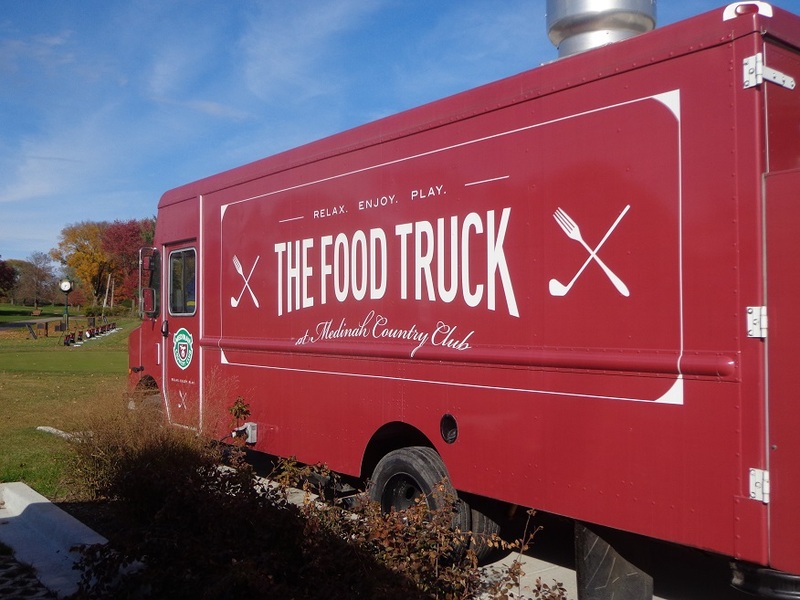 Since 2003 the Howard Street Inn sports bar-restaurant, which adjoins the pro shop, has been a busy year-around facility – not just when golfers are on the premises. While the new nine-holer only faintly resembles May’s carnival-like 18-hole version, the history of that place hasn’t been forgotten. A big history wall fronts the No. 1 tee and the learning center includes an array of photos and memorabilia from May’s big tournaments. Nine-hole rates range from $19 to $21 for non-residents and on-line reservations are being taken for the first time. Though power carts are available, the course is ideal for walking.